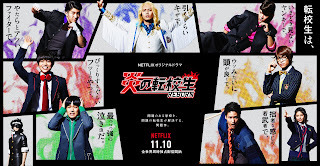 Cast: Shigeoka Daiki, Hamada Takahiro, Kamiyama Tomohiro, Kotaki Nozomu, Kiriyama Akito, Fuji Ryusei, Nakama Junta and Kawashima Umika. While transferring schools Shigeoka Kakeru (Shigeoka Daiki) meets Hikari (Kawashima Umika) at the entrance. Soon after he is thrown into a ring with six other transfer students: a boxer (Hamada Takahiro), a wanna-be samurai (Kiriyama Akita), a narcissist (Fuji Ryusei), a scaredy-cat (Kamiyama Tomohiro), a genius (Nakama Junta) and a yankee (Kotaki Nozomu). For some reason the seven are forced to fight one another, in a “transfer student fight-off”. The group soon decide to run away, but are soon captured, and realize that all have the same first name: Kakeru. After a turbulent first day, they are introduced to their principle, who tells them that they are part of the “Blazing Transfer Student”-mission, where they have to transfer to problem schools and fix the problems from within… But why are they all there in the first place, and how big of a coincident is that they all share the first name? When I heard that all seven Johnny’s WEST were going to star in a drama together, I was so excited. These guys are so funny together, so I was sure it would be fun watch. And I was right: it was so silly that it became hilarious. As Japanese drama goes, this one is most defiantly one of those you’d call “wacky” or just plain ridiculous. But again, since it’s a Japanese drama, it really embraced the silliness and became a good drama to watch, with really nice acting. The storyline is not too confusing, and it actually does keep you watching… kind a. All in all, a funny/silly drama that isn’t that time consuming.